Eternity working in an office…it’s the nightmare that every desk jockey find themselves in…watching their precious lives slip by in a haze of emails, conference calls and soul crushing boredom. 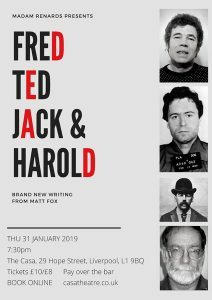 Fred, Ted, Jack & Harold are four such people…or at least they think so. What if eternity was meant literally? What if your soul deserved to be crushed? What if you happened to be the worst of the worst, and every tedious hour spent battling the photocopier was actually payback for the most heinous crimes imaginable? 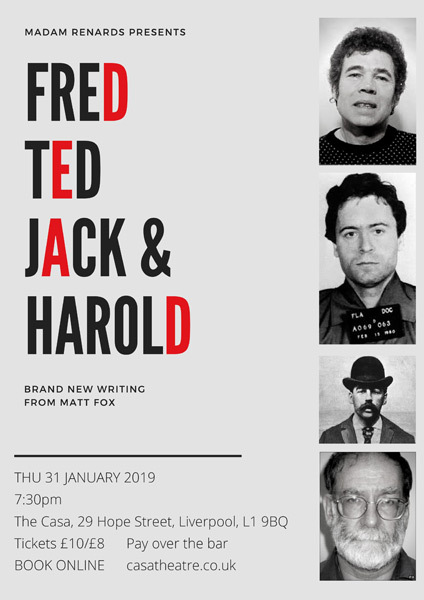 Fred, Ted, Jack & Harold by internationally acclaimed playwright Matt Fox is the darkest of dark comedies, featuring a selection of infamous characters, in a familiar world turned on its head.